St.Mary’s RC Church, Mulberry Street, Manchester. Full transcriptions with register images. 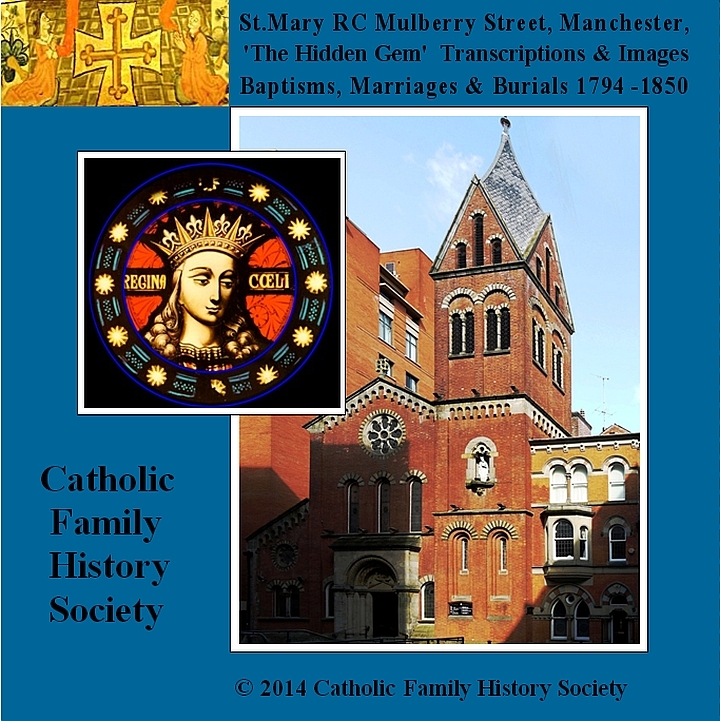 St.Mary’s is the oldest existing Catholic Church in Manchester and Salford. The Manchester Mission first began in 1773, in a room in Roman Entry (off High St.). In 1776, it moved to Rook Street Chapel (off Market St.). The Mission finally moved, in 1794, to Mulberry Street and remained on the same site, as a functioning parish church, to the present day. The Registers have been fully transcribed and, with the exception of the Marriages, are presented in Surname sorted order in searchable PDF format. Baptisms are contiguous from 1794 to 1850. The Burial ground is under the floor of the church (now sealed). The Registers have a seven year gap, with a further 18-month break within the second register. Legal marriages were not permitted here until 1837, but the Register records the Sacrament of Marriage for a five year period. In the absence of a full Marriage Register, there is a list of Parents, extracted from the five Baptism Registers and presented as two (father & mother) surname sorted tables with the child’s Baptism date to help fix a time frame. Also the parents list is supplied as an unformatted (CSV) text file, which may be copied into a spreadsheet for personal analysis. The Clergy are listed, with the date of their first appearance in a register. These records are presented in DVD format and the publication can be ordered on our GENfair site.